I’d just spent eight amazing days in Jordan but there was one more awesome treat in store for me as I boarded my flight from Amman to Amsterdam. 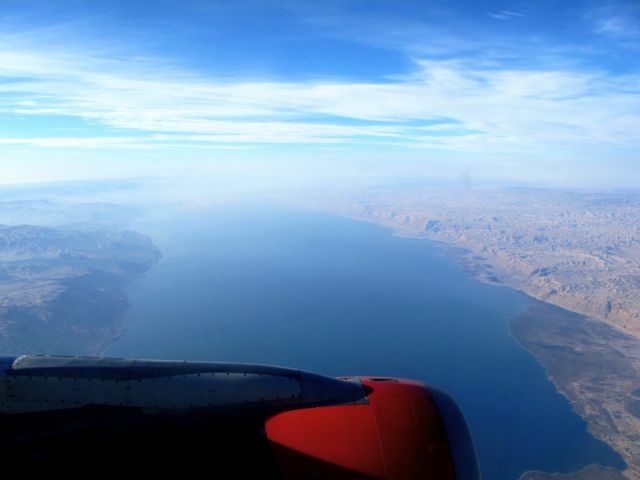 I was seated in row ‘A’ and minutes after the plane took off (in a westerly direction), the East Bank of the Dead Sea came into view. The mountains I’d driven across just a few days earlier looked surreal in the early morning light. The plane window view of the Dead Sea and Israel were incredible! 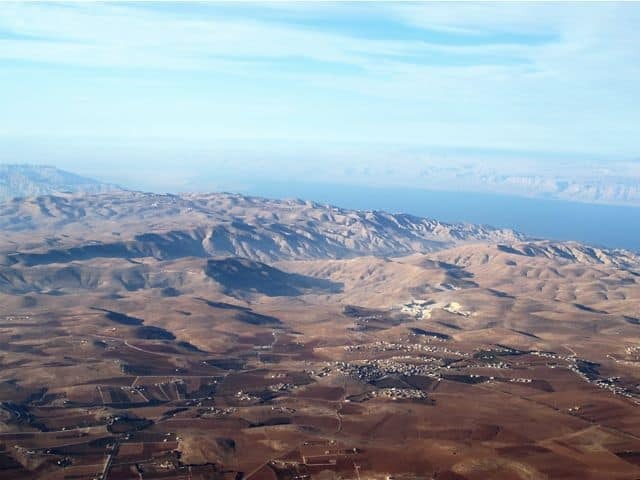 The mountains and the town of Madaba on the East Bank of the Dead Sea. The plane continued its course across the northern flank of the Dead Sea. I spotted the Mövenpick Dead Sea Resort where I’d stayed and enjoyed the wonders of floating in the Dead Sea. A few moments later, the plane crossed into the airspace of the West Bank, passing Jerusalem and Bethlehem. The Mediterranean coast appeared soon enough, reminding me how narrow Israel is (the country is slightly more than 100km wide). We flew right above the international airport of Tel Aviv before passing the city, Jaffa and its beaches. you must try to visit Israel too. Great shots! It’s views like that that make the cramped window seat well worth it. Thanks for that! So interesting seeing those aerial shots. Love it! Beautiful! I love taking aerial shots like this except I am never quite sure of what I’m looking at! I’ll be in Jordan in just a few weeks so I’ll keep these in mind to give me a sense of where I am.